A breezy home round of the FIM Motocross World Championship saw Rockstar Energy Suzuki Europe’s Brian Hsu toasting his second victory of the year on the RM125 with a double race victory in the EMX125 European Championship as Julien Lieber scored his season-best result with seventh position overall in the MX2s 11th-stop in 17 events. Also in MX2, Jeremy Seewer rode to 10th overall; thanks to 12th and 11th positions in the two 30-minute and two-lap motos. Bright skies, dust, ruts and slick terrain coloured the Talkessel hard-pack for this eagerly-awaited Grand Prix and part of a stellar mid-season spell that has also seen other ‘strongholds’ of the sport visited in the UK, France and Italy. A decent crowd ignored the distraction of the FIFA World Cup to travel to support the Rockstar crew that also form such a vital and regular part of the competitive national championship in Germany. 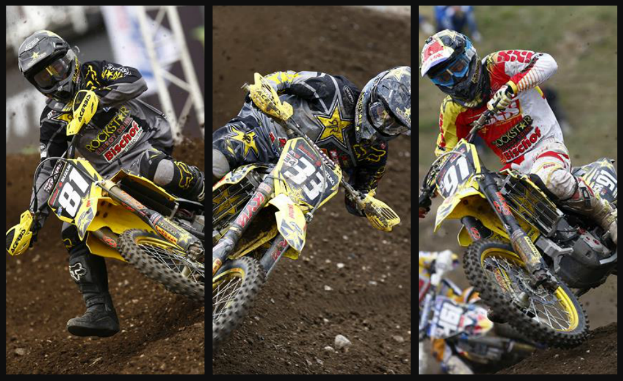 Lieber was able to take some confidence from an attacking and relentless display in both motos. The Belgian has frequently struggled to assert his potential in the top-10 of two sprints on the same day but there was no mistaking his vivacity on this occasion. The ‘#33’ was seventh across the results sheets; in the two races and also the overall ranking. The classification represented his second-best of 2014 and his points tally of 28 was also one mark off his total at the Spanish GP where he bagged 29 and was eighth at Talavera. A few crucial mistakes and a tasty battle with Bulgarian Petar Petrov – that ended-up with the Suzuki rider having to recover his RM-Z250 from the fence – clouded Seewer’s day. The Swiss was 12th in the first moto after falling foul of the duel with Petrov for a top-10 slot and could only improve this position by one-slot in the second moto; this in spite of a small crash. Build-up to the Grand Prix did not go well for Brian Hsu, who crashed and hurt his shoulder while preparing for the fifth meeting of seven in the EMX125 championship. The teenager gritted his teeth on the RM125 and took a superb victory in the first race on Saturday; his second of the season. On Sunday he was again flying and extended his moto successes to three for 2014 for a valuable gain on missing championship leader Davy Pootjes. The results on home turf mean that Hsu guards second position in the series with only a seven-point gap to the Dutchman and the red plate. After scratching off 11 of the 17 rounds in the FIM Motocross World Championship Seewer sits 10th in the standings with 211 points. Lieber is four positions behind while Glen Coldenhoff still retains 13th despite his lengthy absence with injury. While Grand Prix stops for a week prior to the north European stint that takes in trips to Sweden and Finland, Rockstar Energy Suzuki Europe will head to Aichwald for the third round of the ADAC MX Masters series where Seewer and Lieber will again do battle against the 450s in the German championship.